Manager Louis van Gaal says Manchester United could have won the Premier League if they had made a better start to the season. 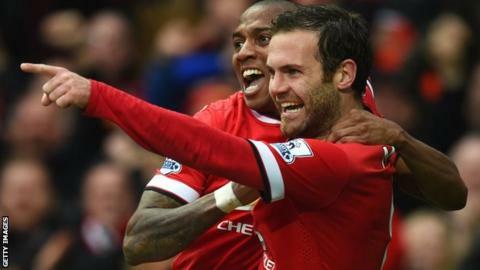 The Red Devils were 10th in the table after 10 matches, having recorded only three wins. But United have established themselves in the top four with a run of 16 wins from the subsequent 23 fixtures. Dutch coach Van Gaal, 63, said: "We had a very bad start. If we'd started well, we could have been the champions." Fourth-placed United face Everton at Goodison Park at 13:30 BST on Sunday and can move - at least briefly - into second place. A win would take them above Manchester City, who beat Aston Villa 3-2 on Saturday, but they could in turn be replaced by Arsenal, who face leaders Chelsea at 16:00 BST. United missed out on playing in Europe for the first time since 1990 after finishing seventh last season, when David Moyes was in charge for most of the campaign. And Moyes' successor says a top-four finish to secure a return to the Champions League remains the priority. Van Gaal said: "I hope we shall achieve our goal for the season and play next season in the Champions League but we still have 15 points to fight for. It is not done yet."